Looks like the old Mac vs. Windows debate now has a political twist to it. 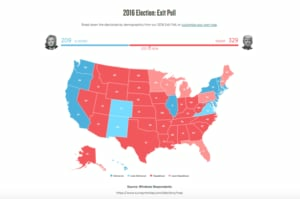 If strictly Mac users had voted in the 2016 election, Hillary Clinton would’ve won in a landslide, according to new data from SurveyMonkey. Based on results from 100,000 post-election interviews, Clinton would’ve hauled in a massive 443 electoral college votes from MacOS respondents, compared to a meek 58 for Donald Trump. Sad! Clinton’s Mac-driven win would’ve been the biggest landslide since George H.W. Bush demolished Michael Dukakis 426 to 111 back in 1988. Ah, but the country isn’t made up of only Mac users, obviously. 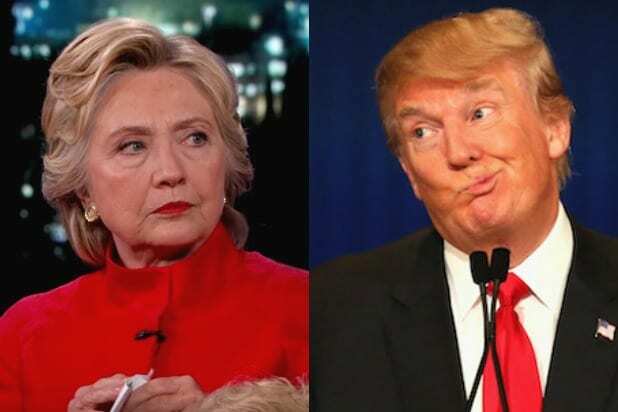 The trend flipped — somewhat — for Windows respondents, with President Trump gaining 329 electoral votes — or 25 more than he won in the real election. If the President proposes new legislation to get Windows PCs into the homes of every American by 2020, you’ll know what’s up. On the surface, the data makes sense; Apple products are pricey, and they’re both favored by people working in “creative” industries and more common in major cities — two demographics where Clinton dominated at the ballot box. Trump’s electoral strength came from rural southern and midwest communities, places where Macs and broadband internet, not to mention jobs where using a Mac is advantageous, are less common. Interestingly, the data for Mac users didn’t hold up for iPhone respondents. Trump would’ve squeaked out a 291-217 electoral edge if only iPhone users voted, according to SurveyMonkey. And Android users love Clinton, apparently, with the survey showing she would’ve had 353 electoral votes if only Droid votes were cast. But before you start eyeing the computer-usage habits of your friends and family for clues about how the next election might go, bear in mind that the PC-Mac split doesn’t mean a one to one split in the electorate. According to Business Insider, Mac users comprised only 7.1% of 2016 home computer market share in the United States. 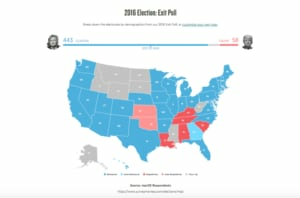 Check out the entire SurveyMonkey map to see how the election broke down over other fault lines, including education, marriage, and gun ownership. Donald Trump's "face-lift" jab at "Morning Joe" co-host Mika Brzezinski was denounced by all sides. 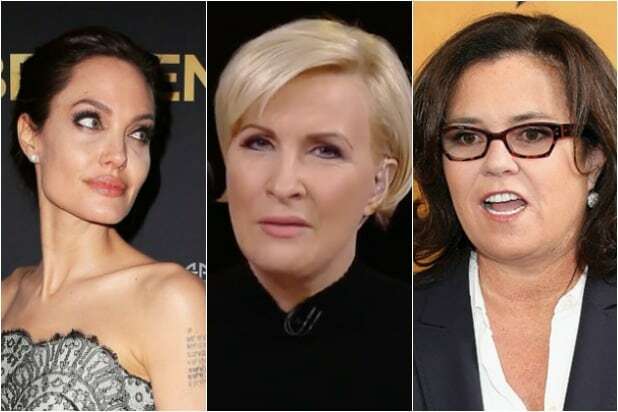 But it was far from the first time he has attacked female critics by insulting their looks, as these 13 women prove. Trump tweeted: "How come low I.Q. Crazy Mika...came to Mar-a-Lago 3 nights in a row around New Year's Eve, and insisted on joining me. She was bleeding badly from a face-lift. I said no!" Jolie has been named "most beautiful woman in the world" by Vogue, Vanity Fair, and others. But in 2007, Trump deemed the liberal actress and humanitarian unattractive: "I do understand beauty, and she's not." Not even a champion Olympic figure skater is exempt from Trump's insults. In November 1992, Trump told New York Magazine that Witt "could only be described as attractive if you like a woman with a bad complexion who is built like a linebacker." In an attempt to discredit rival Carly Fiorina during the Republican primaries, Trump said in a 2015 interview with Rolling Stone, "Look at that face! Would anyone vote for that?" In 2012, he took to Twitter to insult the liberal co-creator of the Huffington Post: ". @ariannahuff is unattractive both inside and out. I fully understand why her former husband left her for a man- he made a good decision." Trump said on a 2006 episode of "Entertainment Tonight": "Rosie O'Donnell is disgusting, both inside and out. If you take a look at her, she's a slob...If I were running The View, I'd fire Rosie. I'd look her right in that fat, ugly face of hers and say, 'Rosie, you're fired." The former Miss Universe said Trump called her "Miss Piggy" and made other disparaging remarks about her body. According to The Telegraph, Trump fired back at Cher in 2012 after the singer criticized then-Republican presidential nominee, Mitt Romney. ". @cher--I don’t wear a “rug”—it’s mine. And I promise not to talk about your massive plastic surgeries that didn’t work," he tweeted. Trump told the New York Times in 2015 that Heidi Klum "sadly" was "no longer a 10." Klum clapped back at Trump's insult with this mocking tweet. Trump took on rival Ted Cruz by insulting Cruz's wife. Trump compared a less-than-flattering photo of Heidi with a glamor shot of Melania Trump and included the caption, "No need to 'spill the beans.' The images are worth a thousand words." The president of the United States isn't the only sexist idiot out there. Here are 11 Actresses Absurdly Accused of Being Too Old or Too Fat (Photos).